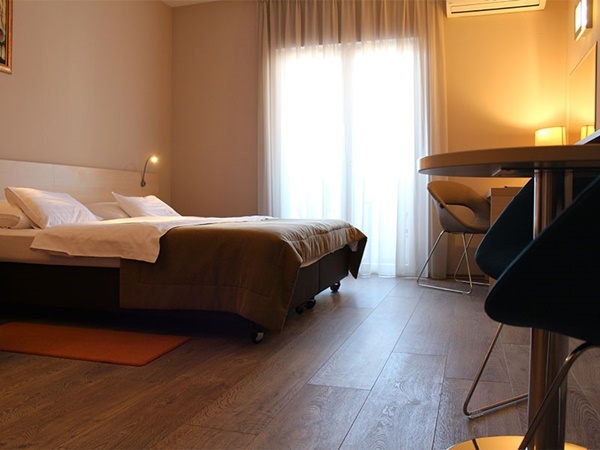 Hotel Berkeley Dubrovnik is a family-owned hotel located in the Gruz neighbourhood, close to the ferry and cruise port. This hotel offers excellent stay for solo travellers, friends travelling together, couples or families. Only a short walk from the hotel you will find: tourist office, travel agencies, rent-a car offices, large supermaket, green & fish market, bakeries, pharmacy etc. Main bus station is located only 5 minutes walk from the hotel. From there you can catch all buses running from Dubrovnik as well as airport shuttle bus. In the near vicinity of the hotel you will find several great restaurants offering local and international cuisine. Hotel Berkeley is modernly decorated hotel which offers accommodation in double rooms, studio rooms and apartments. Double rooms (21m2) have all the necessities for comfortable and enjoyable stay. Studio rooms (28m2) are a great alternative if you seek more comfort. Guests staying in the studios can enjoy views over the pool area and Gruz harbour from the private balcony. With a mini-kitchenette included in the room, guests can make light meals. Apartments (50m2) are ideal for families or guests who prefer extra space and comfort while travelling. Each apartment has a large balcony/courtyard area. The apartment consists of bedroom with king size bed, living room, bathroom and kitchennette area. The apartment also has direct access to the pool area. Most Dubrovnik beaches can be reached by city buses from the hotel. To reach the most popular Dubrovnik beach, Banje beach, you need to take a city bus no.8 from the bus stop in front of the hotel. To reach Lapad beaches take bus no.7 from the bus stop in front of Petka Hotel. Hotel Berkeley has an outdoor area (open from April to October) that includes heated outdoor pool and jacuzzi, sun deck area with lounges and bar where you can help yourself to a refreshing drink. Complimentary wireless internet is available for all guests throughout the entire hotel and in all rooms. At the hotel reception there is also an Internet Point available for guests to use. The restaurant of Hotel Berkeley Dubrovnik is open for breakfast. A continental buffet breakfast is served daily from 07:00 a.m. - 09:30 a.m. The restaurant is available for dinner for group reservations only (minimum 10 persons) and special functions on request. Hotel's bar offers a selection of local wines, beer, spirits and liqueurs. Hotel Berkeley also provides private boat excursions (Lokrum island, Elaphite islands, Mljet island) and charter for their guests as well as external guests. Starting from 2010 they offer fishing excursions on newly purchased fishing boat Wellcraft 33. Excursions can be booked by hotel guests or external guests. If you are arriving by car, the hotel has its own parking available for guests (free of charge). Hotel Berkeley has a fleet of cars available for hire by guests. Also available for hire are scooters and bicycles. Hotel Berkeley is situated in the neighbourhood of Gruz, only a 5-minute from the cruise & ferry port. Hotel is located on Andrije Hebranga street and hotel offers its own parking garage for guests arriving by car. If you arrive by plane and taking a shuttle bus from the airport, ride it until the last stop - main bus station. From there you will need to walk around 10 minutes to reach the hotel on foot. Otherwise, you can book your private car transfer from the airport. From the bus stop only a steps away from the hotel you can catch bus no.8 to reach Cable car and Old Town. From Old Town you can take either bus no.8 to get off close to the hotel or buses no.1A, 1B or 3 to get off near the port and walk for about 5 minutes to reach the hotel.